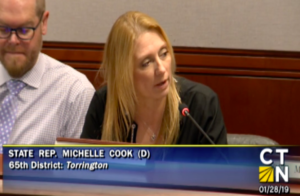 Lawmakers addressed the elephant in the room during a standing-room only meeting of Connecticut’s Education Committee to consider bill concepts, including regionalization of education services. The subject on everyone’s mind was a bill proposal introduced by Sen. Martin Looney, D-New Haven, which would force schools in towns with less than 40,000 residents to merge with larger districts. Senate Bill 454 drew a lot of attention and consternation among town residents, town officials and even some members of his own party. Lavielle questioned whether or not Looney’s bill would be dealt with separately or would be part of the concept of regionalization being discussed by the Committee. 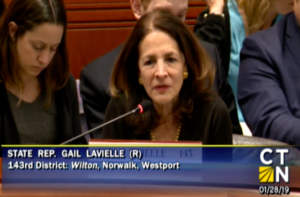 Lavielle represents the Town of Wilton which was one of the towns alarmed by Looney’s bill because, if passed, the legislation would force them to merge with neighboring Norwalk. Sen. Will Haskell, D-Wilton, and Sen. Alexandra Bergstein, D-Greenwich, both put out statements saying they could not support such legislation. McCrory said the concepts under review were only to offer incentives to school districts which choose to regionalize some of their services. But some Democrats on the Committee felt that forcing regionalization might be necessary. 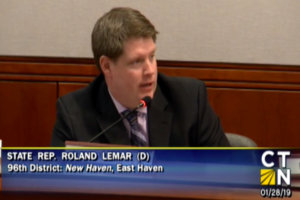 Rep. Roland Lemar, D-New Haven, said the Committee must have conversations that “cause distress to the status quo,” and said it was a “shame” communities would be distressed by the idea. “A lot of communities have benefited greatly by the structural inequities that are inherent in our system today,” Lemar said. The difference of opinion regarding what should be on the table for discussion appeared to be divided along the lines of each lawmaker’s school district. While Lavielle, Bolinsky and McCarthy represent school districts which perform well, Cook and Lemar come from districts which face problems in education funding and quality. New Haven and Torrington are part of the state’s Alliance District, which is a group of the state’s 33 lowest-performing districts. As part of the Alliance District, these areas are able to receive “targeted investment” by the state, but must also have their education plan approved by the Connecticut State Department of Education. The Alliance Districts are often shielded from cuts to state education funding, while better-performing districts like Wilton or Newtown face the potential of funding cuts as Connecticut wrestles with budget deficits. Connecticut’s education system is often touted as a highlight of the state’s quality of life, but Connecticut also faces a large achievement gap in school performance. Ms Cook: this is a capitalist democracy. We earned these schools. I started with zero and sacrificed to buy into this school system for my children. I did not whine. I did not expect handouts. That’s how it works in America. Your contention that you have any right or power whatsoever to FORCE ANYTHING ON ME because YOU KNOW BETTER bespeaks a very, very dangerous political philosophy. You aren’t closing the achievement gap by stealing from me. Raise your performance, don’t lower mine. Follow our example (strong and involved nuclear families).